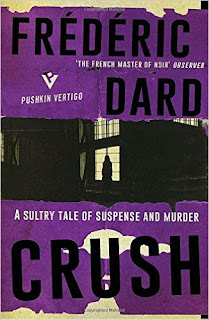 The good people at Pushkin Vertigo tell me in a short section at the back of this novel that this book is one of Frédéric Dard's " 'novels of the night', -- a run of stand-alone, dark psychological thrillers written by Dard in his prime, and considered by many to be his best work." It's good, all right, as is his Bird in a Cage, both of them read over the course of one night while I was once again wide awake. What I find interesting about both books is that somewhere toward the beginning of each, the main characters say or think little things that sort of grate on the mental ear, cluing me into the notion that there may just be something very off with these people who are telling us their stories. It's nothing big, there's really nothing anyone can put his or her finger on at the moment, but that little mental niggle picked up on by my inner radar has come back to me in both books at some later point, leading to the "aha - I knew it!" moment in my head. Let's start with Crush, which has a bizarre but good ending that in hindsight I should have seen but actually never saw coming. The "I" here is 17 year-old Louise Lacroix, living at home in Léopoldville, in a neighborhood that's "all stunted little houses, lined up any old how on a plain surrounded by chimney stacks spewing out great clouds of smoke..." She lives with mom and her "mum's man" Arthur (having never known her dad) in a rented "ramshackle, barely furnished house" that hasn't seen repairs in years, even though the "walls are crumbling like nobody's business." She's also always hated the town, because she saw it as "artificial and sad." Louise has a job in a local factory, but we soon discover that she needs a change, starting with her route home from work each evening. Changing her way home takes her through the center of town, where "you can feel the money round there," where she discovered the home of the Roolands, a couple known locally as "the Yanks" existing "on a sort of desert island all its own... where the natives seemed to live bloody well..." Returning home late one evening, she gets into it with Arthur, and runs to the Roolands' where she offers her services as a maid. Eventually Jess and Thelma agree and Louise convinces them that it would be better if she lived in. While Thelma drinks away her day while listening to music, Jess works at NATO, and soon enough Louise is happy in her new situation. One incident drives her home, but the American couple provides enough financial incentive to Louise's mother to bring Louise back. It isn't long though until tragedy strikes, and suddenly we're left wondering exactly what the truth is behind the events that follow. 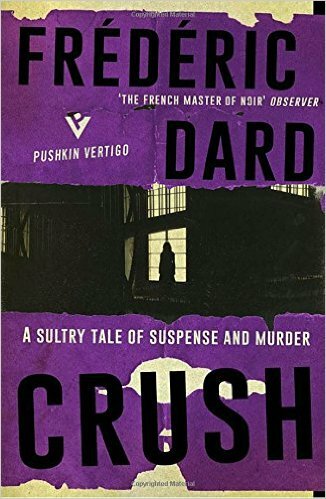 Dard does such a good job here that as I said, I should have seen what was coming and absolutely did not. Once I'd finished, though, I was in awe of just how well the author had set things up, and I didn't mind at all that I'd been so cleverly manipulated. Au contraire - I actually appreciated it. 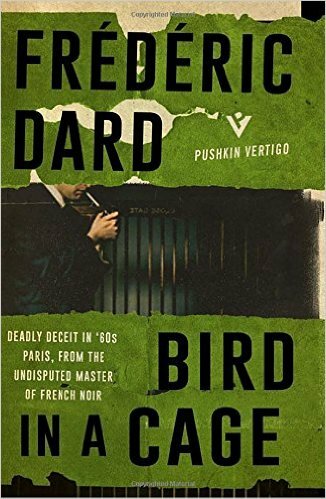 Moving onto the next book, Bird in a Cage, another of Dard's romans nuits, I was a bit worried at first that I was reading something along the lines of Cornell Woolrich's Phantom Lady, because in many ways Bird in a Cage begins with just that sort of feel. As things turned out though, I was entirely wrong. It's Christmas Eve, and Albert has come back home to Paris and to his mother's apartment after being away for six years. Mom has died, and he has returned to an empty, but still unchanged place. After laying back in his old bed for a while, thinking he'd give anything to see his mom "just for a second, standing behind the door," and to hear her asking him if he was awake, his sorrow takes over and he needs to get out. Off into the night, into his old quartier he wanders, after having stopped in a shop to buy a Christmas decoration, a "silver cardboard birdcage sprinkled with glitter dust" with a blue and yellow velvet bird inside on a perch. Next stop is Chiclet's, a "big restaurant" where as a child he'd stop and look through its windows "at the opulent part of humanity holding court inside." It's there that he runs into a woman who reminds him of a woman from his past named Anna, but this woman has a small child with her, and Albert suddenly feels the tragedy of the "shared loneliness" of the two. After a short stint at a movie theater, Albert walks the woman (still nameless at this point) home; she invites him up for a drink and some impulse drives him to hang the birdcage on the woman's Christmas tree. The little girl is put to bed, after which the woman reveals that she would really like to go out for a while, and they talk about her marriage which is extremely unhappy. Returning her to her home, Albert realizes that they're not alone -- there's now a coat hanging on a hook that belongs to the woman's husband, who is lying on the sofa dead as a doornail. Albert quickly tries to remove traces of himself from the apartment, cleaning up fingerprints, etc., but when he goes to get the birdcage, he discovers that it is no longer hanging on the tree. It's at this juncture where the story really takes off, as Albert is forced to make a confession to this woman, who promptly throws him out after telling him she'd get in touch with the police about her husband's death. But he just can't leave, so he waits, hiding outside and watching as things get weirder and weirder before he steps in once more and gets the surprise of his life. When I finished this novel, to say I was blown away is to very much understate how I felt about it. Frankly, I thought it was just genius. I think my insomnia may have been caused by a) first the tension that kept ratcheting up throughout the story and b) just laying there thinking about the book and about just how cleverly Dard put things together here. It's like I was expecting one thing and then out of nowhere, it became an entirely different ball game altogether, where everything changed completely. Passing on this book because it was written in 1961 would be a shame -- it's absolutely perfect for vintage crime readers, for readers who enjoy French crime, and for readers who are looking for something different in their crime fiction. My advice is to run, do not walk, and pick up a copy ASAP. This one I just loved. Absolutely. So, are these books considered "classics"? I'm trying to read one before year's end and hoping the library has these books. My other question is are they overly violent? 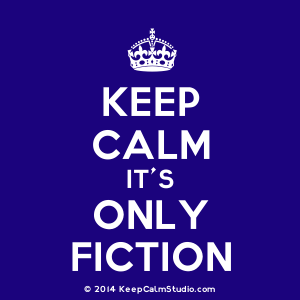 It seems like creeping psychological suspense is the genre here. Classics - I don't know, but as to question 2, no, they're not at all overly violent. Psychological is right.